To work on these challenges and opportunities, the ACE-network has been created. It consists of heritage and research organizations from 10 countries which aim to promote contemporary archaeology at a European wide level, by emphasizing its cultural, scientific, and economic dimensions, including its manifold interest for the wider public. They undertake research, documentation and related activities along four major thematic axes: 'Researching the significance of the past'; 'Comparative practices in archaeology'; 'The archaeological profession'; 'Public outreach: invitations to archaeology'. The network is funded (2008-2012) by the Culture Programme of the European Commission. The European Archaeology Abroad-program explores the impact of European archaeological policies and professional practice on local communities and sustainable development of heritage projects undertaken in the developing world. It investigates the historical, institutional and political frameworks of international collaboration in foreign archaeology from the view of several European Nation States, including France, Germany, Spain, Poland, Belgium, Greece, Hungary and the Netherlands. 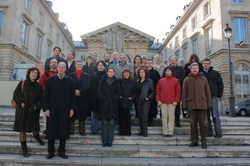 It will lead to the publication of the book ‘European Archaeology Abroad’ in 2012.
aims at an analysis and description of Archaeological Resource Management in Germany, the Benelux and Switzerland. It is carried out in collaboration with the DAI (Frankfurt) and the VIOE (Brussels). The result will be a hand book. As part of the ACE-research theme which focuses on the archaeological profession, in 2009 an inventory was made of the impacts of the global economic crisis on Dutch archaeological heritage management.